A few weeks ago we (the studio) were taken to Federal Delicatessen for lunch by some work mates (the suits) The moment I saw the place I was “I have to bring Le Boyfriend here” I just completely fell in love with it, probably because of it’s 1950’s diner’s vibe. So this weekend I took Le Boyfriend on a date. I have to reaffirm this, I just fell in love with this place, I don’t know if its the vintage diner look or the food but it’s just great. There is a immense attention to detail, from the menu to the waitresses uniform (retro eggshell blue), to the food styling and the tiny little decorations around the place. I think we got a bit overly excited and order a bit much but it was the place and time to do it. We started off with some drinks, Le boyfriend went with his signature drink Le Old Fashion but this one was actually made with rum instead of whiskey (it was called old nut) and I ordered a Cola Nut & Fresh Lime soda. We shifted for the second round, I went for a Green Grocer (Gin, celery, cucumber & citrus) and he went for a cherry cola. 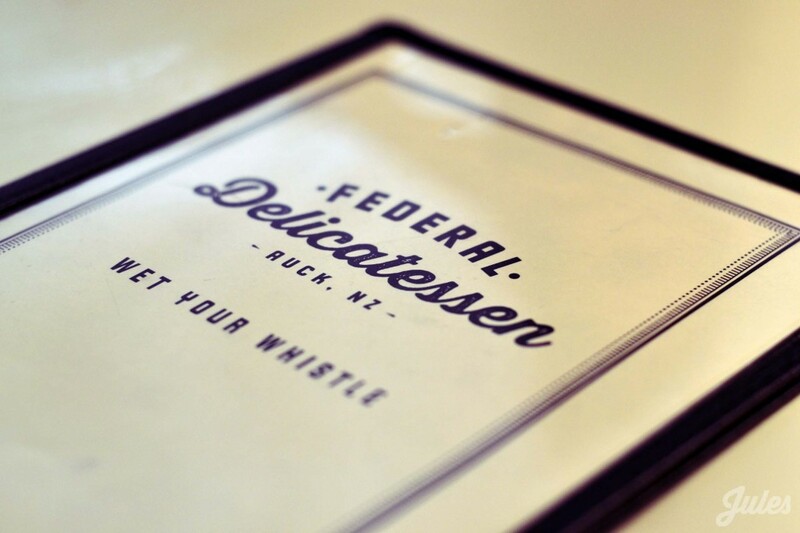 If you are around the city Federal Delicatessen is offering two courses for $25 as part of Auckland Restaurant month so this is your chance to give it a go. Hace unas semanas unas compañeras de trabajo (los trajes) nos llevaron (al studio) a almorzar a Federal Delicatessen (Al lado de la Sky Tower) En el momento en que vi el lugar pensé “Tengo que traer Le novio urgente” Me enamore completamente, probablemente por su onda tipo Diner de los años 50. Así que este fin de semana lleve a Le novio a una cita. Tengo que reiterar esto, me encanto este lugar, no sé si es la onda retro o la comida, pero es simplemente genial. Hay una inmensa atención a los detalles, desde el menú a los uniformes (color “Verde tiffany’s”), a la presentación de los platos y la decoraciones de todo el lugar. Creo que nos excitamos un poco y pedimos bastante comida, pero era el lugar y el momento para hacerlo. Comenzamos con algunas bebidas, Le novio eligió su bebida clásica, Le Old Fashion pero éste estaba hecho con ron en lugar de whisky y yo pedí un refresco Nuez de Cola y Fresh Lime. Cambiamos para la segunda ronda, yo elegí un trago llamado Green Grocer (Gin, apio, pepino y cítricos) y el pidió un refresco de cola de la cereza. Si están por la ciudad Federal Delicatessen está ofreciendo dos platos por $25 como parte del mes del restaurante de Auckland por lo que esta es el momento de darle una oportunidad. Oh yes! I’ve been wanting to take The Koala here too. I want to try their poutine, the reuben sandwich and maybe something else. I’ve heard that it’s expensive, but very, very good. It’s tricky to imagine a diner being a special occasion place. I know i don’t usually think of a diner being a fancy place but The way it’s put together makes it a bit more special I think, it not an average diner.